Sixty-four chapters are included in this volume. Anatomy and Physiology of the nose and paranasal sinuses are discussed in detail, along with evaluation and imaging. The specific disorders covered include granulomatous and inflammatory diseases, fibro-osseous lesions, neoplasms, epistaxis, rhinosinusitis, osteitis, and many more. 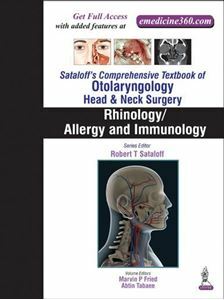 Separate sections discuss the evaluation and treatment of allergy and rhinitis, anesthesia, surgery of the nasal airway, surgery for inflammatory sinusitis, and endoscopic skull base surgery and surgery of the orbit. This volume is a thorough guide geared towards practicing otolaryngologists and otolaryngology residents. Chapters 19 and 50 contain video(s).